Collaborate on integral / interactive / playable visualizations and scenarios to govern and control the innovation of your organization. 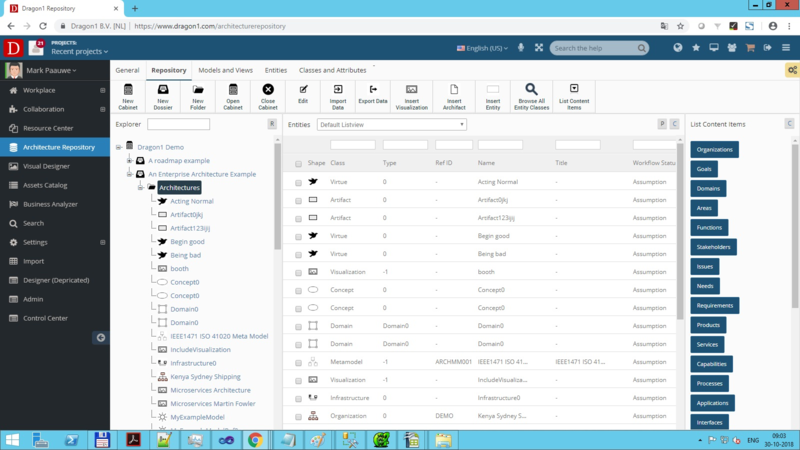 We will discuss on this page the products you can create, which Dragon1 applications are available, what templates are available and what services we as organization provide you with, all for Dragon1 ENTERPRISE. Dragon1 consists of Dragon1 Applications. These Applications are to create and share the animated and playable products. 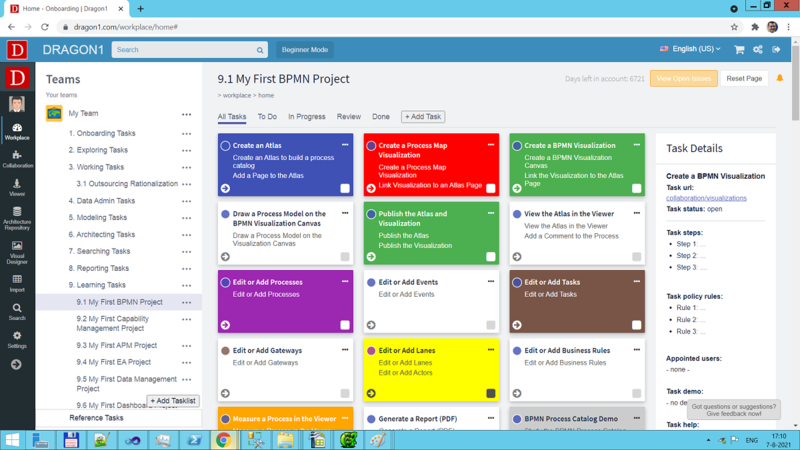 A digital workplace with a Task Manager is provided to enable efficient collaboration and workflow online. With the Dragon1 Applications you can create integral / interactive (also static) / playable products. Learn, create and share products online and task-based. 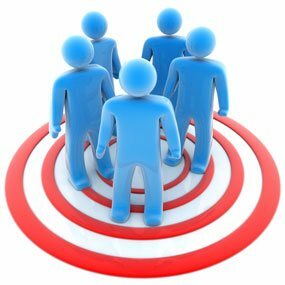 Creating and managing entities, relationships and models. 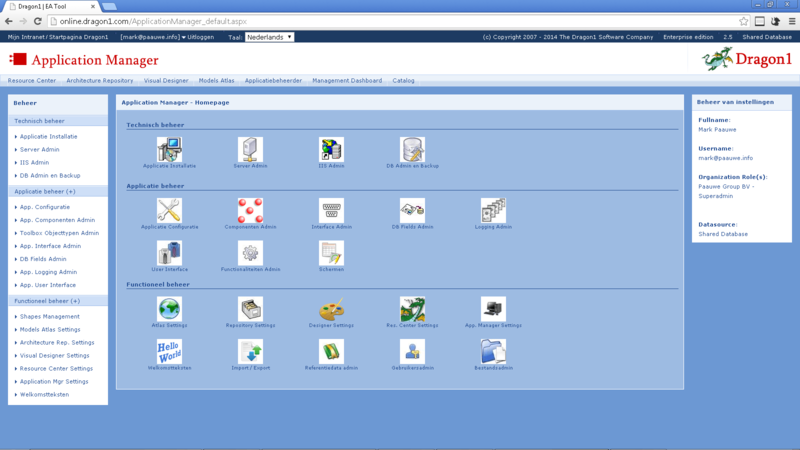 Create Viewpoints and Views for ArchiMate and BPMN. Publish your working & architecture experience internally and externally. Architecture Repository - Store, structure and manage your data. - Define your own entity attributes. Resource Center - Organize reference documents and information in a miniwebsite / wiki. 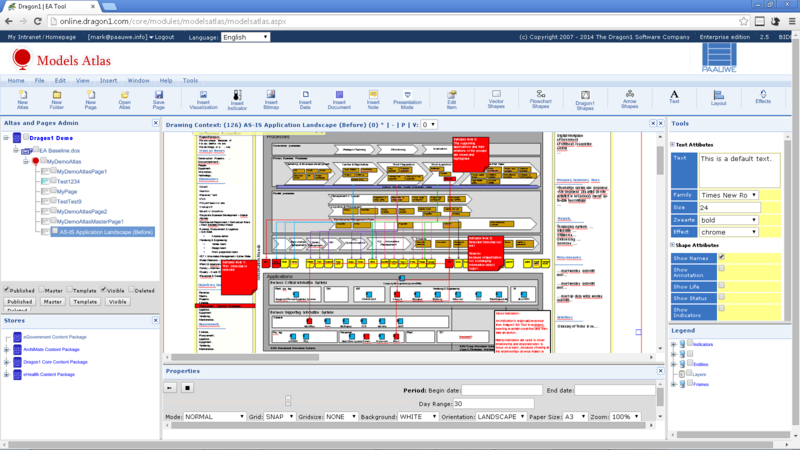 Dragon1 ENTERPRISE is used to create and share static, dynamic, interactive / responsive Business Diagrams. The unique feature for which it is mainly used is creating animated / playable scenarios, such as Process and Application Landscapes, Technology Roadmaps, Business Blueprints, Strategy and Project Landscapes. 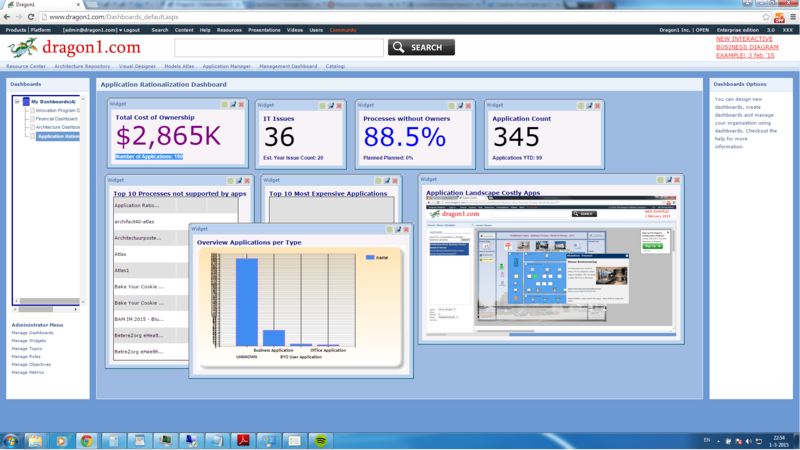 The following are some examples of visual products produced on Dragon1 using the ENTERPRISE edition. Create and share static, dynamic, interactive and animated concept maps, concept design sketches and conceptual site models. Create and share static and dynamic, interactive and animated product innovation designs, IT innovation designs, business innovation designs and enterprise innovation designs. Create and share static and dynamic, interactive and animated business models, business process models and business model canvases. Create and share static and dynamic, interactive and animated IT Landscape diagrams, managed IT resources and Governance Risk and Compliance Process Models. 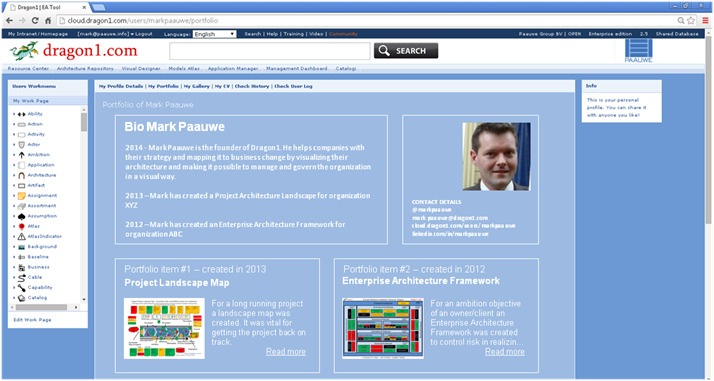 Create and share static and dynamic, interactive and animated frameworks, blueprint, landscapes and roadmaps. 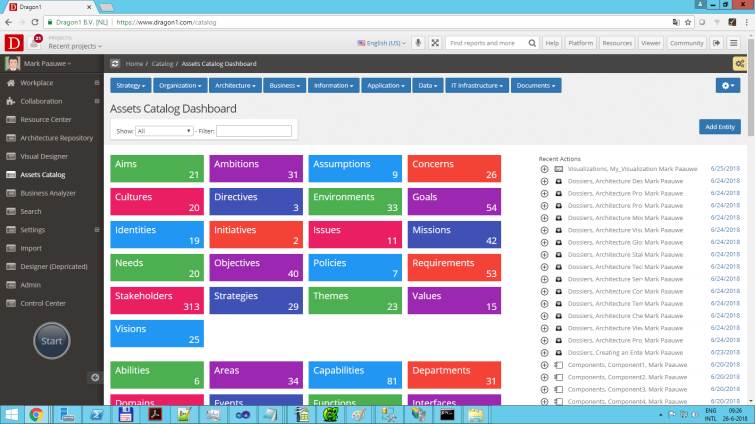 Create and share static and dynamic, interactive and animated GANTT charts, project landscape maps and project organization charts. 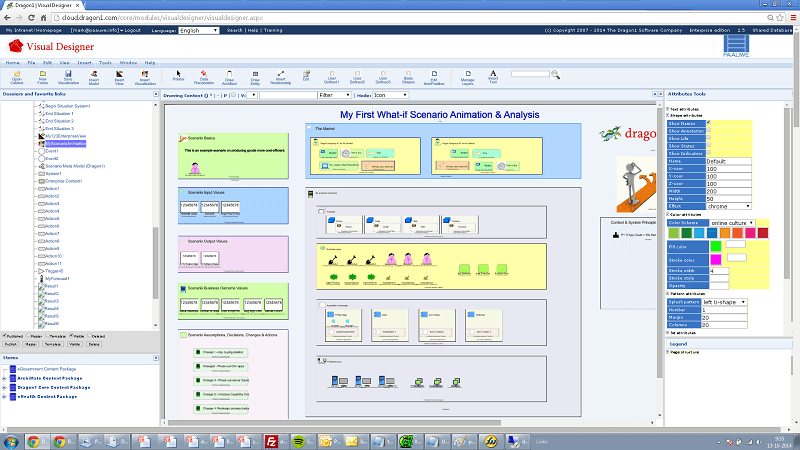 An example scenario analysis animation. 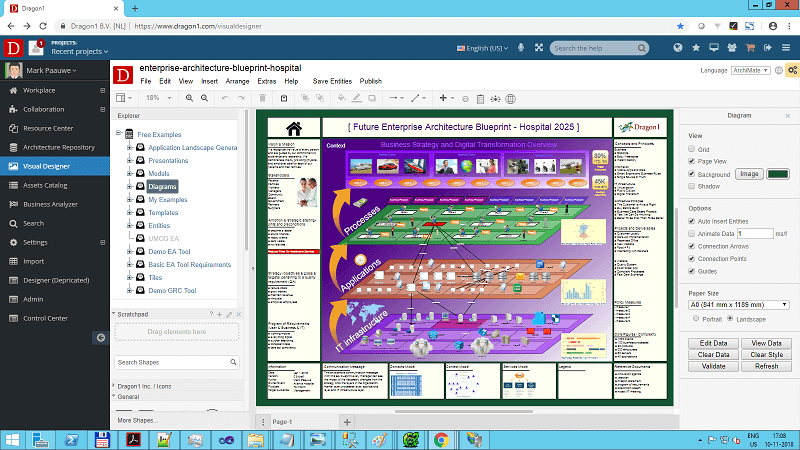 List of Architecture Templates - The Big Five (Concept Diagrams and Blueprints): Enterprise Architecture Overview, Governance Architecture Overview, Business Architecture Overview, Information Architecture Overview, Technology Architecture Overview. Other templates are: Application Landscape, Process/Application Landscape, Technology Roadmap, Project Landscape Map, Enterprise Architecture Framework, and much more. List of Diagramming Templates: - Mind Map, Strategy Map, Moodboard, Info Graphic, BPMN overview, ArchiMate Introductory view, UML Use Case, FlowChart, TOGAF Capability Diagram, Dragon1 Architecture Model, Business Case Presentation. Read about the dynamic view feature: dynamic views, to get even more out of your templates.